Step On stage Performing Arts as estabished in 2006 by Emma-Louise Tinniswood to provide expert tuition and training to children and young people in the performing arts. Our aim is to make theatre accessible to as many children as possible and offer them a wide range of performance opportunities to develop their skills and passion for the arts. Step On Stage Productions, the youth theatre part of the school was founded in January 2011 and in 2 years we have now produced 5 shows. We produce Comedy, Musicals, New Writing, Shakespeare and Drama and auditions are held 3 times a year. We perform at the Hampton Hill Playhouse, Normansfield Theatre and Riverside Studios, Hammersmith. Our teachers, directors and choreographers are all experienced industry professionals with many years experience in TV, Theatre, Film, Youth Theatres and teaching. 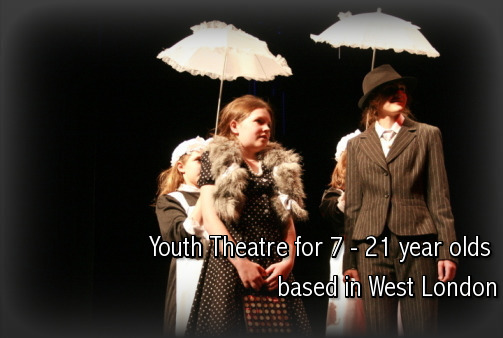 A number of children in the youth theatre are also part of our agency, Step On Stage Management and have appeared on TV, Theatre, Film and Music Videos including Andrew Bird Music video, Polaroid85 music video, Little Crackers, Dove, Samsung, Nissan, Canon, Richmond pantomime, and on stage at the Royal Opera House and Rose Theatre.